If you've been by Columbus Circle recently, you've noticed that the monument to Christopher Columbus is shrouded in scaffolding. This has been built for a dual purpose -- beginning in November, it will be used so that conservators can clean and restore the 120-year-old monument. But until then, the area atop the scaffold has been transformed by artist Tatzu Nishi into a living room where you can see the Columbus statue up close and personal. In the years leading up to [the Columbus quadricentennial in] 1892, Carlo Barsotti, the publisher of the Italian-language paper Il Progresso Italo Americano diligently promoted the idea that Columbus be honored in New York, which was fast becoming one of the largest centers of Italians in the world. Through public subscription, Il Progresso raised the money for a statue to be erected...and hired Sicilian artist Gaetano Russo to create a monument to be ready for October 12, 1892. It was unveiled in the newly named Columbus Circle as part of the celebrations for Columbus Day. Nishi's installation takes Columbus out of the public sphere and reexamines Russo's artwork not only as part of a domestic scene -- there are couches, newspapers, and CNN running on a big-screen TV -- but also as a stereotypical American cultural reference. The wallpaper Nishi has designed for the installation features other American icons, such as the Empire State Building, Elvis Presley, Michael Jackson, baseball, and the old west. The installation runs through November 18. Admission is free, but timed tickets are required and can be requested at http://www.publicartfund.org/view/exhibitions/5495_discovering_columbus. We're told that it is particularly compelling at night, though we've only seen it from the exterior after sunset. 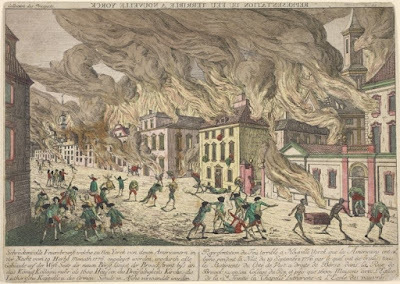 By the time the fire was extinguished, New York was firmly in British hands and it would remain the British center of authority until November 25, 1783 -- Evacuation Day. One thing that ticked off the Americans left behind in the British-occupied city was the fact that none of the fire damage was repaired. Throughout the war the area west of Broadway was left to smolder in ruins. 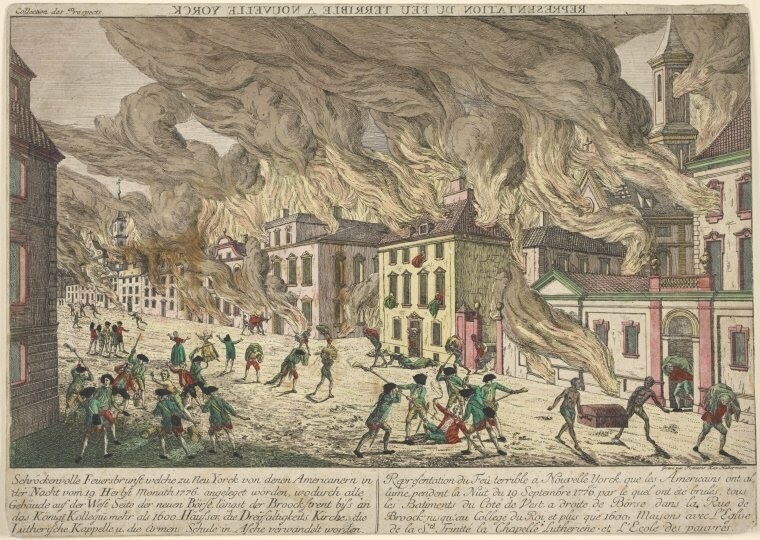 Much of the rebuilding -- including re-erecting the city's main church, Trinity, Wall Street -- would not happen until the 1790s. On September 14, 1901, William McKinley succumbed to the gunshot wound he'd suffered eight days earlier at the Pan American Exposition in Buffalo, New York, thus elevating Theodore Roosevelt to the presidency. 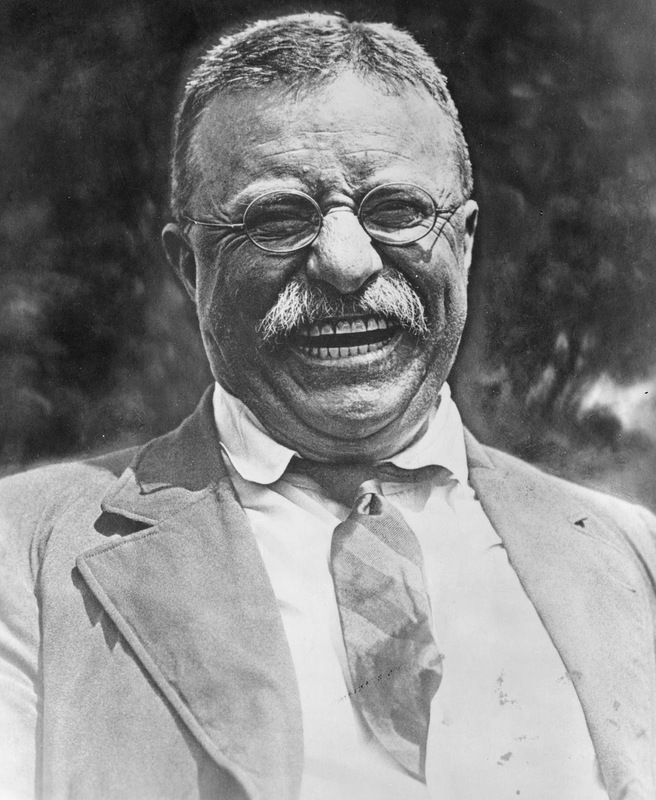 [Roosevelt] was born on October 27, 1858, in the family’s brownstone townhouse at 28 East 20th Street. Often in poor health as a child, much of Teddy’s later bully and bravado was the result of the exercise he undertook in and around Gramercy Park, Madison Square, and Union Square—where his grandfather lived—to boost his physique. The Roosevelt family moved out of the 20th Street house in 1872, and in 1916, the building was demolished to make way for a restaurant and retail shops. When President McKinley was shot on September 6, Roosevelt rushed to Buffalo, but the president's condition soon improved and it was thought that sending Roosevelt to join his family on vacation would send a hopeful signal to the American people. Roosevelt and his family vacationed in the Adirondacks and on September 13, the Vice President summitted Mount Marcy. Camping at Lake Tear of the Clouds nearby, Roosevelt's party was interrupted by a trail guide who had come with a telegram from Secretary of War Elihu Root: "The president appears to be dying and members of the cabinet in Buffalo think you should lose no time in coming." Roosevelt quickly descended twelve miles to the Tahawas Club, a hunting resort, and then left via stagecoach (in the dark and the fog) to North Creek, the closest train station. By the time Roosevelt had reached North Creek, McKinley had died, and Roosevelt was sworn in in Buffalo later that day. 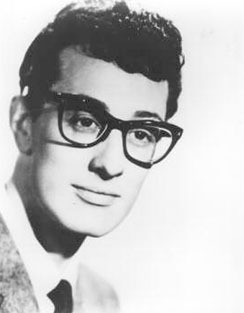 September 7, 2012, would have been the seventy-sixth birthday of rock and roll icon Buddy Holly. Alas, Holly died February 3, 1959, in a tragic plane crash in Clear Lake, Iowa. On the 50th anniversary of Holly's death, we ran a popular story about his time in New York City, which we are reposting below. 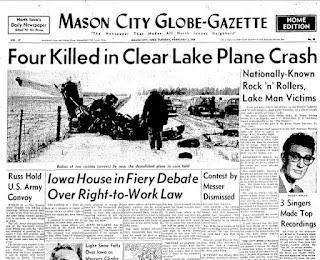 Today, February 3, 2009, marks the 50th anniversary of the “day the music died”—the plane crash in Clear Lake, Iowa, that claimed the lives of Ritchie Valens, the Big Bopper, and rock and roll pioneer Buddy Holly. Originally from Lubbock, Texas, Holly was one of the earliest stars to take what was then still being called “race music” and cross over to white audiences. His early hits with the Crickets—including That’ll Be The Day, Peggy Sue, Oh Boy!, and Not Fade Away—had a profound influence on later acts (including the Beatles and Bob Dylan, who were huge fans) and are still some of the greatest rock songs ever written. From print and online sources, it seems unclear if Buddy Holly lived in Apartment 4H or Apartment 3B (though 4H seems to get the nod from more definitive sources). Whichever apartment it was, he set up a home tape recorder and in December 1958 made his final recordings, among them Crying, Waiting, Hoping and Peggy Sue Got Married. Posthumously released with overdubs and studio trickery, the original tapes have circulated for decades among collectors. They were recently included on the definitive Holly rarities set, Down the Line. When Holly moved in to the Brevoort in 1958, he paid $1,000 a month rent for a corner unit with a wraparound terrace. A two-bedroom apartment in the building (which has been a co-op since 1981) now goes for about $1.495 million.